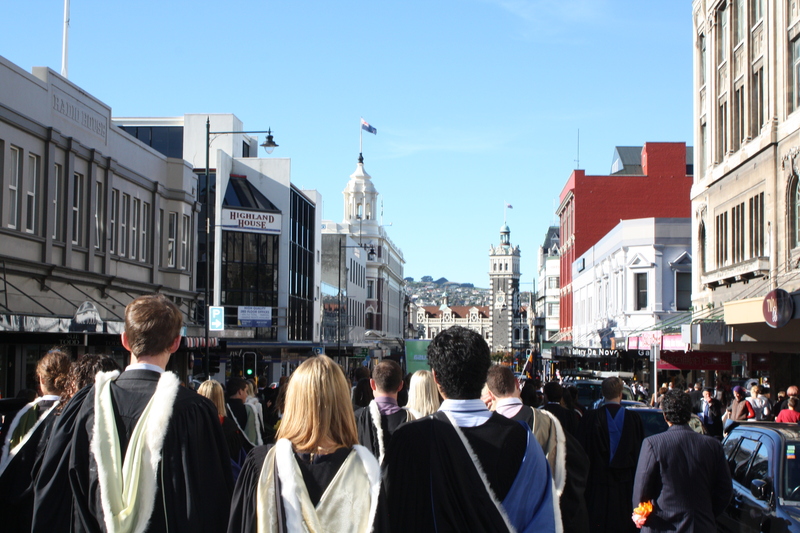 It’s mid Autumn, meaning that here in Dunedin it’s Graduation time. For me this meant taking pictures of my two flatmates who both graduated on Saturday. Unlike my graduation in December last year, they were lucky enough to have a beautifully clear day, with azure blue skies and crisp autumn foliage. It also marked some of my classmates graduation, meaning that the last Design Studies students from the University are now graduates. I’m pretty proud of us, the last Design Studies class, we certainly had an interesting experience, but we came out the other side and now have degrees! As I wasn’t graduating, and technically working as a photographer, it was really lovely to see how everyone’s friends and families were there for them. It was hard not to get caught up in the day with my flatmates and their families. Graduation is a big tradition in Dunedin, and everyone chooses to celebrate it slightly differently. For me it was a personal dinner with my family, but walking around Dunedin in the evening it was evident that everyone else had their own interpretation of how best to celebrate. So congratulations to everyone who graduated and will be over the next few weekends. If anyone is in need of a photographer, I’m free!